Like Eddie Murphy, Fred MacMurray and Glenn Close before him, it’s a shame to see Jim Carrey reach the “animal co-star” portion of his film career. But that is just what happens in Mr. Popper’s Penguins, very loosely based on Richard and Florence Atwater’s 1938 children’s book. Carrey plays a career-driven executive who neglects his home life, particularly his relationship with his former spouse and child. 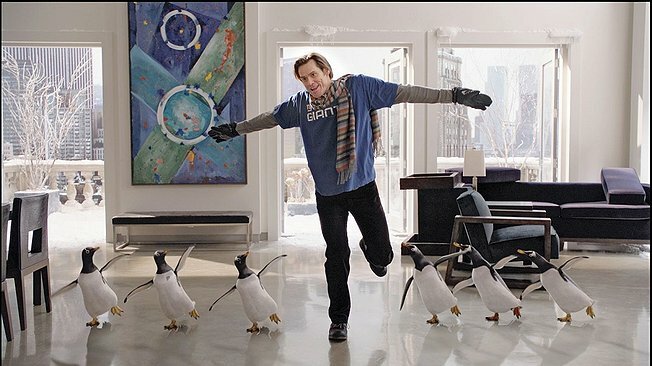 It’s essentially the same role Carrey had in Liar Liar, except instead of the curative properties of unadulterated truth, Mr. Popper discovers the healing power of a waddle of penguins. As a NYC real estate shark, Popper’s last rung up the corporate ladder involves the task of procuring the purchase of Tavern on the Green from its geriatric owner (Angela Lansbury). His only apparent pal is his loquacious assistant Pippi (Ophelia Lovibond) parades a persistent parlance that prescribes pronouncing the letter P as often as possible during her prosaic prattle. Popper’s efforts are sidetracked, however, when he suddenly receives six penguins bequeathed by his equally absentee, recently deceased father. He tries mightily to farm out the birds until, well, he actually finds a zookeeper (Clark Gregg) willing to take them off his hands. For some reason, Popper acquiesces to the whims of his suddenly interested children, who force daddy to choose between keeping the avian sextet just so they can occasionally play with them, or having his kids hate him for getting rid of them. So, Popper transforms his condo into an igloo and nearly loses his job. Typical silliness ensues, as the foul fowl – portrayed by actual, yet freely anthropomorphized penguins – somehow teach Popper life lessons and (shocker!) heal his strained relationship with his kids and ex-wife (Carla Cugino). He also gives the penguins characteristic nicknames like Bitey and Loudy, with not much imagination needed to know how each tuxedoed creature gets its moniker. This is particularly true of Stinky, as director Mark Waters – the relatively surehanded director of Freaky Friday, Mean Girls, and The Spiderwick Chronicles – wallows in animal reaction shots and the grating poop/flatulence/crotch gags that have infested what passes for contemporary children’s cinema. The birds do display an affinity for watching the kindred waddling in Charlie Chaplain movies, so at least there are glimpses of quality cinema sprinkled about. Otherwise, as with Murphy in his lesser efforts, only Carrey’s quick-witted ad libbing keeps this kiddie comedy semi-watchable. Otherwise, Mr. Popper’s Penguins will leave you cold, and probably a bit spheniscidaeaphobic to boot.